We have a confession to make: we hate email. Is there anyone out there who truly enjoys seeing a full inbox each morning? Not us. 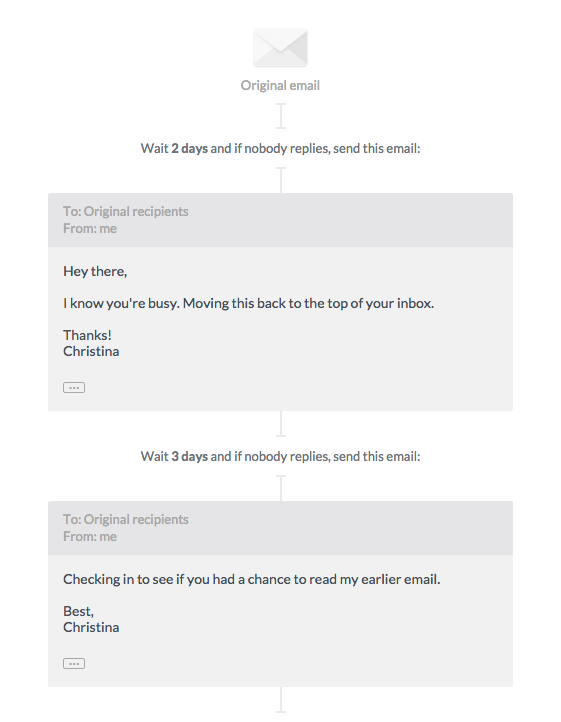 Because of this, much of what FollowUp.cc helps our customers do is to be more efficient in LESS email. We strive to help our customers close deals, make sales and get things done in less time with less work. Auto Follow-ups are exactly what they sound like: you compose and send an email like normal and then let us handle the follow up. You can edit your followup template at FollowUp.cc by logging into your account and clicking Auto Follow-up. You can edit the time frame and the actual message of each of these pieces of the auto follow-up to whatever suits your needs best. For example, I could add one last message to this sequence set to 10 days later if nobody has still replied and ask if there’d be a better time to connect. Or, I could decrease this to only one email 5 days later if I don’t want to overdo it on following up. There’s complete flexibility, but the beauty of the auto follow-up is you can send your original email and forget it – and still increase your chances of getting a response! Give it a shot and watch your response rate soar. There’s nothing worse than being heads-down on a really important project and getting an email notification that takes you out of the zone. Not only is it frustrating, it’s actually really detrimental to your productivity. It takes the average worker 23 minutes and 15 seconds to get back on task after a distraction. 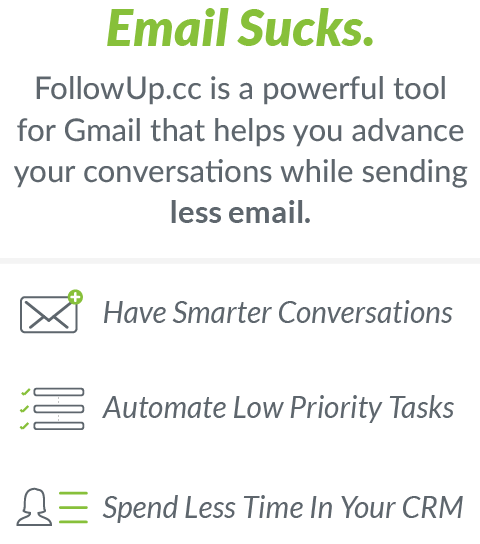 Here’s how you can use FollowUp.cc to get back into the zone quicker and easier: simply snooze the email until later. In 5 seconds or less, you can eliminate the offending distraction and not worry about forgetting to return to it later. The email will disappear and then pop back up in your inbox at the specified time. It’s like magic! Say I’m in the middle of writing my latest blog post and I get this email from Free People about a top they brought back in stock. I really want to check this out but I know better – if I click the email, there’s a good chance I’ll get distracted shopping online for far too long and I’ve got stuff to do! So I simply click the snooze icon to the left of the email, snooze it until later today and then the email will reappear at 6:00 pm. I could also pick an exact date and time if it was a more sensitive email. OR, if I’m really tempted to get distracted by a group of emails, I can just as easily select multiple emails and select snooze above and snooze them all at the same time. Nice try Sephora, Apple and Kate Spade, but I’ve got a blog post to write! While there’s no magic prescription we can give you to say “the best day and time to send an email is X,” there are general best practices to follow. You want to send your email when less emails are being sent if you’re optimizing for a response (which we highly recommend). This means sending email early in the morning or later in the evening after the workday. Generally, inboxes are less cluttered at these times and recipients have more time to read and respond to your message. Another benefit to Send Later is if any of your recipients are located in various timezones. You can account for this difference so they receive your email at the optimal time too. There you have it! 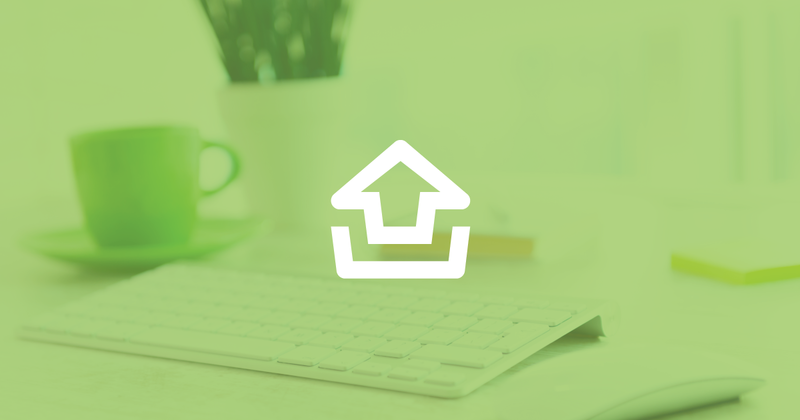 Three new ways of using FollowUp.cc to work smarter, not harder. Tell us in the comments below: are there other ways you use FollowUp.cc to send less email or work more efficiently?